By far, the best way to get the sounds you want is to record them yourself. When GIANTS Software made Farming Simulator 2015, it had people go out to manufacturers of farming equipment and record the exact sounds of the various machinery included in the game. In the process they even burned up one of their microphones with the exhaust heat from one of the tractors. Fortunately you don’t need to run out and buy a collection of microphones and cabling. As an independent modder, you can make do with what you have. Even a mic on your mobile phone is a starting point. As you get more serious about modding, you can look into possibly renting audio equipment or purchasing a portable field recorder. Prices on these devices are reasonable, with entry-level ones starting at less than $100. If you want to purchase one, search online for “field recorder” to see your options. 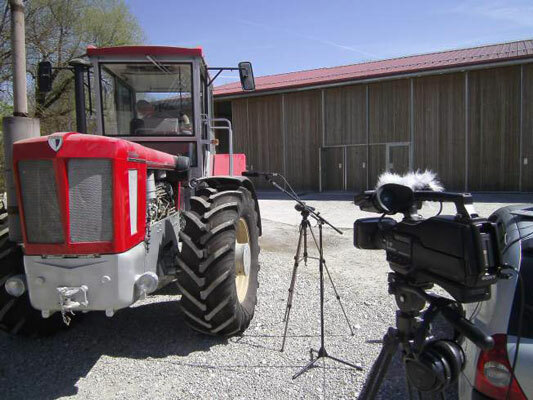 What actually may be more difficult is getting access to the machinery that you want to record. Not everyone lives near a farm or knows a person who works for a farm equipment manufacturer. That said, people are generally friendly and reasonable if you approach them in a polite, professional manner and clearly explain what you want to do. Isolate the sound you want from all other sounds. Despite how they make it look in TV shows, separating sounds in a single audio track without degrading the overall quality of the recording isn’t easy. You’ll want to try do your recording away from all other sounds. If you have a directional mic, like a shotgun mic, be sure to aim it directly at the source of your sound. Use headphones while recording. Most recording gear has a jack for connecting headphones. Use it. And use the best quality headphones you can get your hands on, preferably ones that fully cover your ears and isolate them from outside noise. Having a great microphone does you no good if you have no idea what sounds it’s actually recording. Record more than you need. Record the sound multiple times and record it for a longer duration than you need. You can always edit a sound to be shorter; getting multiple takes of a sound ensures you’re not stuck with a version of the sound that has a train running in the background, for example. Record room tone. Room tone is a term for the sound of silence at the location where you’ve also recorded the sounds you actually want. That is, you should turn off all machinery at the site and record 30 to 60 seconds. Room tone is valuable when editing sound. Aside from being in a vacuum, no place is soundless, and microphones often pick up on things that you may not notice until you’re trying to splice two sounds together, and you then notice an awkward jump in background noise.